I am a senior Religious Studies major at Davidson College. I am interested in the historical and social components of religious traditions, particularly Christianity, and how religious faith influences one’s worldview. This summer, I have the pleasure of being a Research Assistant for Archives & Special Collections. I am excited about this opportunity to contribute to “Around the D”! 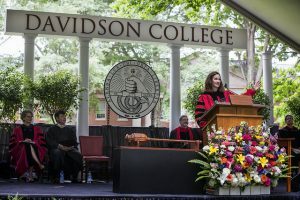 Last weekend, Davidson College held its 181st Commencement. Featured prominently on the commencement stage, on the right of the speaker, is the Davidson College Mace. 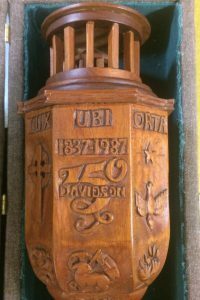 Hand-carved by Mr. Jack Ramseur ’31, the Davidson College Mace was presented to the College on January 29, 1988, in honor of the College’s Sesquicentennial Celebration. In medieval times, maces were traditionally weapons of war. Carried by knights or royal bodyguards, maces were used to protect royalty during processions. By the 14th century, maces assumed more ceremonial functions. The ceremonial mace, usually about four feet in length, survives today as a symbol of authority. Carried by the Chief Marshal in the commencement procession, the Davidson College Mace ceremonially marks the beginning of commencement proceedings. 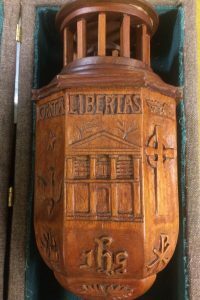 The carving on top of the mace represents the cupola of “Old Chambers,” which was the center of the College’s academic life from the late 1850’s until its destruction by fire in 1921. Below the cupola is the eight-sided base of the dome of the present Chambers building, which was rebuilt in 1931. 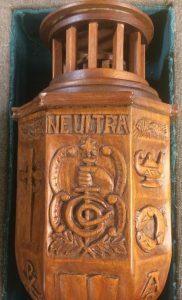 Forming a circular band just below this base are the words Ne Ultra from the college seal and the words of the college motto Alenda Lux Ubi Orta Libertas (“Let Learning Be Cherished Where Liberty Has Arisen”). The college seal, designed by Peter Stuart Ney. The knop of the mace consists of four wide and four narrow panels. Each wide panel represents symbols of the College, while each narrow panel reflects the College’s historical ties with the Presbyterian Church (USA). Under the “Orta”, there are three Christian symbols with Presbyterian associations: the star of epiphany, the holy spirit descending in the form of a dove and the burning bush. 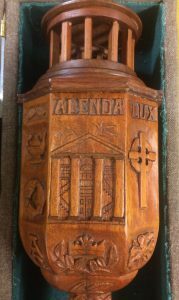 Davidson’s Presbyterian heritage is further reflected in the mace’s carved crosses. The sesquicentennial logo, designed by James Burkey Belser ’69.